Laurent Ponsot’s five barrels of 2006 Morey-St.-Denis Mont Luisants tasted for a second time this spring after assembly for bottling represent a return to the 100% Aligote that his great grandfather had planted in 1911, an act which, Ponsot insists, followed a then long-standing tradition of planting that grape in especially chalky and/or nosebleed sectors of the Cote de Nuits. Nectarine, apricot, fresh lime, and iris inform this wine’s effusive bouquet, and a patisserie-like overlay of yeast and vanilla offers lovely counterpoint; speaking of which, a subtly tart fruit skin and citrus zest note I associate with this unjustly maligned grape runs throughout. The interchange of mineral and bright citrus and pit fruit on display here ? yet accompanied by a plush texture ? is reminiscent of Riesling, and there is a depth of flavor and a richness beneath the wine’s ripe, juicy acidity that promise at least a decade’s worth of fascinating further evolution. The 2005 was even more strikingly ? and somewhat more adamantly ? mineral from barrel, and will surely be worth a search of the marketplace. Ponsot was not ready to show the bottled wine this Spring. 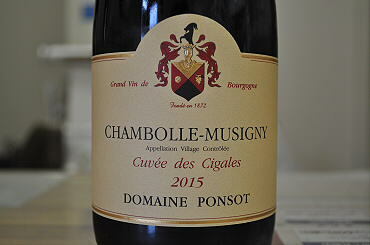 Given this wine’s virtues, it is small wonder that Ponsot is bullish enough on Aligote to have planted more. But he adds that it will take at least a decade for fruit from these vines to merit consideration for white Mont Luisants. Pale ruby / brick. 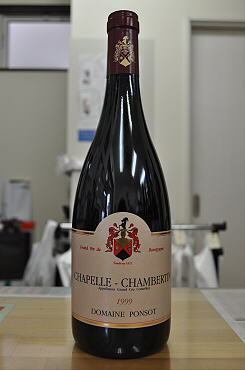 Beautifully perfumed nose of dried cranberries, violets, cinnamon and a hint of aniseed. In the mouth this is a superbly structured Burgundy with crisp acidity sustaining the length of the palate and a medium+ level of very finely grained tannins. Layers of complex floral, earth and fruit flavours combine with ethereal results in the very long finish. Wow. Drink now ? 2015+. Tasted October 2008. 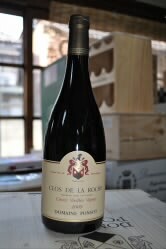 The 2009 Clos de la Roche Cuvee Vieilles Vignes is round, sweet and totally enveloping. 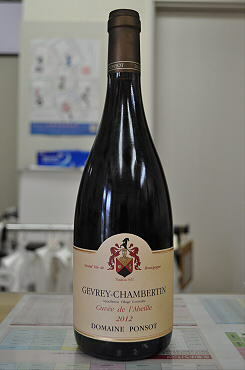 It is a huge, towering Burgundy that impresses for its gorgeous inner perfume and juicy, exuberant fruit. This shows tons of richness without being heavy or overripe in any way. Anticipated maturity: 2029-2049. The estate’s flagship 2005 Clos de la Roche Cuvee Vieilles Vignes surges from the glass in an aromatic tidal wave of liqueur-like black raspberry essence, cinnamon spice, praline, chocolate and heady floral sweetness. Incontrovertibly fat and full, not about clarity or discretion but rather about thick, sumptuous layers of flavor that blanket the palate, this will not be every taster’s idea of a great Burgundy ? or perhaps even a good time. Still, there is lift, bright juiciness and a sense of emerging elegance in a finish where sheer intensity and unabashed richness rule but neither the fruit nor tannins are the least bit coarse, and stony, chalky underpinnings break the surface with their own sort of austere beauty. The Clos de la Roche Vieilles Vignes (sometimes one of the 5 or 6 greatest wines of Burgundy) has an excellent spicy, ripe nose but alarmingly light, shallow flavors-my rating may be too generous. From one of my favorite wine producers in Burgundy (and one who charges a high tariff for his products), this wine is excusable.